America by car è la mostra che il Withney Museum ha dedicato al maestro della fotografia americana Lee Friedlander, a cura di Elisabeth Sussman e Sondra Gilman (4 settembre-28 novebre 2010). Il prolifico autore americano stupisce ancora una volta inventandosi questo straordinario viaggio in auto attraversando l’America. Diversamente da quanto ci si aspetta, sono poche le immagini in movimento. Il parabrezza si fa quadro, tela, schermo nel quale Friedlander costruisce geometrie rigorose, collimazioni visive tra primo piano e sfondo;un dialogo continuo tra il paesaggio urbano innanzi e il paesaggio retrostante riflesso nello specchietto. Friedlander mette in mostra con ironia e leggerezza il postmoderno paesaggio americano ricco di forme e simboli. Granai, case della middle class, cimiteri di auto, insegne stradali, cartelloni pubblicitari, fabbriche, formano un atlante del paesaggio urbano americani più forte nella sequenza scelta nel catalogo, con continui rimandi tra una foto e l’altra nella composizione della doppia pagina, che nella mostra stessa. Il catalogo, dedicato a John Szarkowsky l’insostituibile direttore del Dipartimento di Fotografia del Moma, non presenta nessun testo o apparato critico che interpreti la ricerca di Friedlander in quanto non necessario. America by car è efficace e diretto nel comunicare l’intento del suo autore perchè, come accade anche per le fotografie di Stephen Shore, ne risulta una fotografia immediata che ha differenti livelli di lettura da quelli intellettualmente più sofisticati a quelli per un pubblico generico. L’accostamento nello stesso luogo di Friedlander e della mostra “Modern life: Edward Hopper and his time” dimostra quanto Hopper abbia influenzato con le sue vedute di case vittoriane, bar, negozi, la fotografia. Friedlander è uno dei protagonisti della fotografia americana erede del rivoluzionario stile documentario adottato da Walker Evans durante la campagna per la Farm Security Administration voluta da Roosvelt dopo il crollo di Wall Street del ‘29. Nel 1975 William Jenkins cura la mostra “New Topographics: Photographs of a Man-Altered Landscape” alla George Eastman House a Rochester a cui partecipano Stephen Shore, Frank Gohlke, Joe Deal, Nicholas Nixon, Bernd & Hilla Becher, Lewis Baltz, Robert Adams,John Scott, Henry Wessel Jr. L’attenzione riportata dai fotografi verso quei paesaggi del quotidiano, poco visti ma presenti nella vita di tutti i giorni, determina un cambiamento fondamentale nella narrazione del mondo attraverso la fotografia. Un altro aspetto non secondario che emerge è il tema dell’attraversamento della frontiera, sia essa la conquista del New West, nelle mobile-houses ritratte da Robert Adams, sia nel catalogo di fabbriche, operata dai coniugi tedeschi Becher. L’evoluzione delle tematiche rappresentate dai fotografi come nuovi topografi costituiscono un momento di rottura con l’ingombrante tradizione fotografica americana legata ad Ansel Adams,Minor White e i maestri ottocenteschi come Timothy O’Sullivan e Carleton Watkins; i quali hanno rappresentato la vastità del paesaggio naturale delle grandi montagne: da Yosemite Park al Grand Canyon. America by Car è solo il più recente dei lavori di Friedlander che, nella sua lunga attività, ha raccontato l’America focalizzando la sua attenzione non solo sul tema del viaggio e del nomadismo tipico dell’american dream, ma anche sulla memoria e il patriottismo come nel caso di “The american monuments”(1976). Qui Friedlander racconta lo stereotipo del patriottismo americano girando di stato in stato, alla ricerca dei monumenti che gli americani hanno issato ai loro eroi. Degli ultimi lavori, America by car è sicuramente il più riuscito rispetto a Sticks and Stones dove l’uso del grandangolo nel ritrarre i paesaggi urbani non sempre è così efficace nel restituire fotografie interessanti. Nonostante ciò a un genio della fotografia gli potremo perdonare un piccolo passo falso? America by Car is the latest exhibition about the American master of photography Lee Friedlander curated by Elisabeth Sussman and Sondra Gilman at the Whitney Museum (september 4-november 28, 2010). The prolific American author surprises us once again with this extraordinary journey across America by car that, contrary to what we might have expected, presents but a few images taken in a moving car. 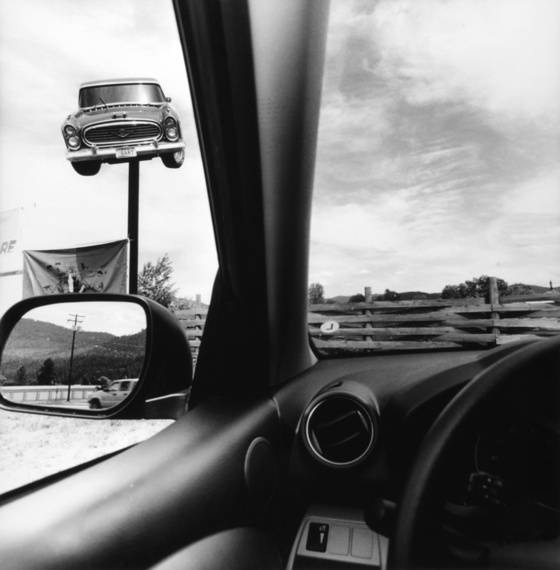 Instead, the windshield frames the picture and becomes a canvas, a screen for Friedlander to build meticulous geometries, visual compositions where foreground and background merge in a constant dialogue between the urban scenes in front and the landscape reflected in the rearview mirror. It is the postmodern American landscape with its richness of symbols and shapes as seen by Friedlander’s spirited and light-hearted eye. Grain silos, middle-class houses, car graveyards, road signs, billboards, factories form an atlas of the American urban landscape that is better defined in the sequence selected for the catalogue, with constant references in the pictures from one spread to the next, than in the exhibition itself. Dedicated to John Szarkowsky, irreplaceable director of the MOMA’s Department of Photography, the catalogue offers no text or critical contribution about Friedlander’s research – it is not necessary as America by Car instantly and successfully conveys its author’s intention and, like Stephen Shore’s pictures, forms an immediate portrait allowing for more intellectually sophisticated interpretations as well as the general public’s surface reading. The presence in the same venue of Friedlander’s work and the exhibition Modern Life: Edward Hopper and His Time shows the extent of the latter’s influence on Friedlander’s views of Victorian houses, bars, shops, and photography as a whole. Friedlander is one of the masters of American photography, heir to the ground-breaking documentary style used by Walker Evans in his campaign for the Farm Security Administration created by Roosevelt in the aftermath of the 1929 Wall Street Crash. In 1975 William Jenkins curated the exhibition New Topographics: Photographs of a Man-Altered Landscape at the George Eastman House in Rochester with contributions by Stephen Shore, Frank Gohlke, Joe Deal, Nicholas Nixon, Bernd & Hilla Becher, Lewis Baltz, Robert Adams,John Scott, Henry Wessel Jr. The focus those photographers brought to the ordinary landscapes hardly ever seen in exhibitions although ubiquitous in daily life marked a fundamental shift in the way photography narrated the world. Another not secondary element was the idea of border crossing emerging in Robert Adams’ survey of mobile-houses colonizing the New West or in the catalogue of factories created by the husband and wife team of German photographers Bernd and Hilla Becher. The evolution of issues portrayed by the photographers as new topographers also represented a shift away from the cumbersome tradition of American photography embodied by Ansel Adams, Minor White and the 19th century masters Timothy O’Sullivan and Carleton Watkins who had described the vast natural landscape of the great mountains: from Yosemite Park to the Grand Canyon. America by Car is just the latest offering in the work of Friedlander, a photographer who, in his long career, has narrated America by exploring the issues of journey and nomadic life typical of the American dream as well as those of memory and patriotism as illustrated in The American Monuments (1976). There Friedlander illustrated the stereotype of American patriotism in a journey across the states surveying the monuments built by the American people for its heroes. In the context of his recent production, America by Car is certainly a more successful work than Sticks and Stones where the use of the wide-angle lens on the urban landscape was not uniformly convincing and sometimes failed to produce interesting pictures. A stumble that can be gladly forgiven to a real genius of photography.